The habitats of Great Britain, Europe and Africa boast some of the most interesting and adaptable members of the avian world. This accessible and fully illustrated guide presents some of the rare and familiar species of these lands. From the grace of a mute swan to the striking casque of an African crowned hornbill, each has the power to enthrall. The book includes diverse species such as the racket-tailed roller, Siberian jay, African fish eagle and paradise flycatcher, as well as kingfishers, parrots, hawks, sunbirds, woodpeckers and many more. 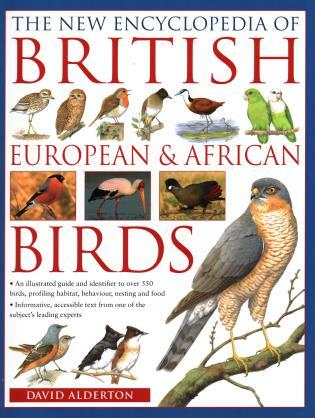 An expert, accessible introduction explains how birds evolved, their different habitats and habits, and practical tips on fieldcraft and birdwatching to help you identify and record the species you spot. The directory of over 550 species features intricate artworks, and describes everything from variable plumage to bill shapes, distribution, size, food, eggs and nests, plus maps detailing distribution. Over 535 illustrations and photographs plus distribution maps. David Alderton has had a lifelong interest in birds, and has traveled widely, observing them on every continent in a wide range of different habitats. He has also been involved with birds in the conservation sphere.